Early Bird Registration (by Jan. 23, 2019): $125 Member (PNWS-AWWA, PNCWA) / $165 Non-Member / $55 Student. After Jan. 23, 2019: $150 Member /$190 Non-Member / $80 Student. Cost includes lunch and light snacks in the morning and afternoon. Coffee, tea, and water will be provided throughout the day. A networking social will take place at the end of the day. Registration and payment deadline is Friday, February 1, 2019. No refunds or cancellations will be accepted after that date, however, substitute registrations are welcome. Please email requests for substitutions or cancellations. "No shows" that have not prepaid will be billed. Darcie McAlister dmcalister@woodinvillewater.com for registration questions. Erika Schuyler erika.schuyler@murraysmith.us for all other inquiries. We have such a fabulous response this year, sadly registration for the event is closed. Please feel free to join us for the Final Presentation and Networking Event from 3:45 – 5:30pm, free of charge and compliments of the Planning Committee. Thank you for your support of the Symposium. We are excited to announce the Seattle-area Women in Leadership Symposium will be taking place on Wednesday February 6, 2019.
to step up as stewards of our lives, communities, and world. Join us for a day to network, share strategies, and learn about tackling challenges - as you navigate your career path. This symposium is all about women leaders at various stages of their career and in different circumstances learning from each other. A) Communication/Career Development, B) Technical, and C) Mentoring. 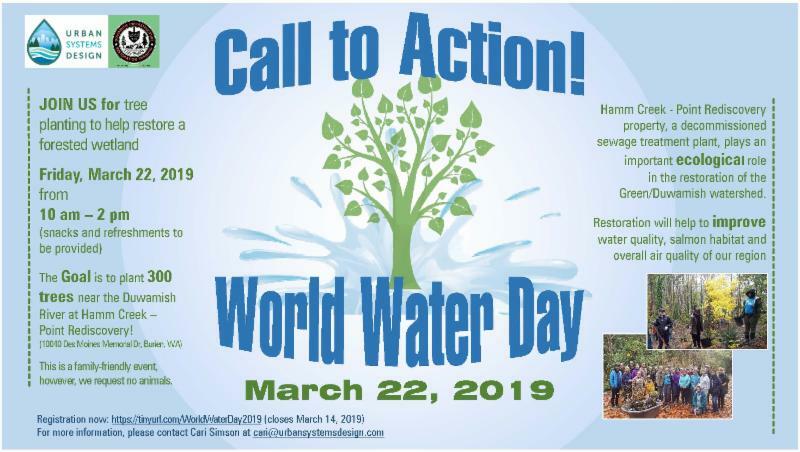 World Water Day - March 22, 2019. Join us! Click for more information. Note: Photographs may be taken of attendees in connection with the Women In Leadership symposium. AWWA-PNWS may use such photographs with or without names for any lawful purpose, including for such purposes as publicity, advertising, and web content. Sponsorship opportunities are available through the registration page. Please contact Darcie McAlister dmcalister@woodinvillewater.com for more information.